The new CLAW cable sleeve is a unique solution for permanently installed climbing protection systems, allowing employees safe access when working at heights. The cable sleeve is suitable for vertical access on solid core steel wire ropes with a diameter of 3/8" (9.5 mm) & 5/16" (8 mm). The CLAW boasts features that simplify use and reduce the risk of an accident. Its double safety construction also prevents incorrect installation, thanks to the integrated locking mechanism. In addition, a skull symbol indicates incorrect installation while an UP arrow identifies proper installation. 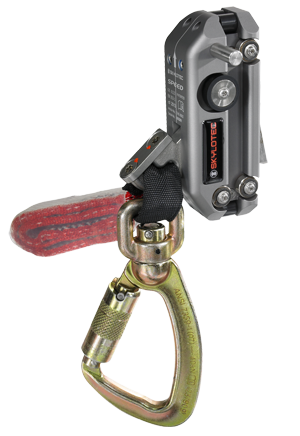 If the climber slips or falls, the CLAW activates and locks onto the cable, arresting the fall within inches. The CLAW is suitable for maintenance or servicing work in the Wind Energy, Telecommunications, Electrical Utility, Oil & Gas and General Industry where vertical cable systems are present. 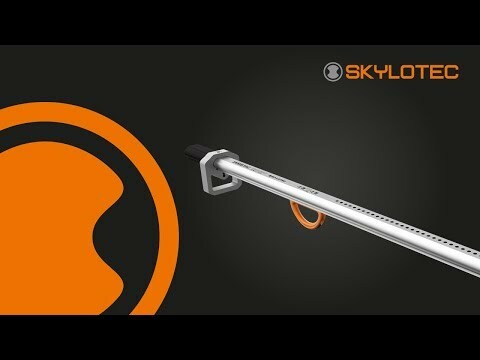 If the climber slips or falls, the locking cam pivots downward instantly and the CLAW locks onto the cable. The built-in shock absorber pack reduces the impact force, and thus the forces exerted on the human body, far below 1,348 lbf (6 kN). The cable runner meets ANSI A14.3-08, CSA Z259.2.5-17 and OSHA requirements. Its weight capacity is 110 lbs (50 kg) to 330 lbs (150 kg). German engineered to fit 3/8 inch (9.5 mm) and 5/16 inch (8 mm) solid core wire rope. High quality lightweight stainless-steel construction. Smooth travel up and down the vertical system. Redundant safety features reduce the risk of improper installation. Shackle and swivel carabiner for a maximum ease of use and freedom of movement. Compatible with all types of chest D-Rings. 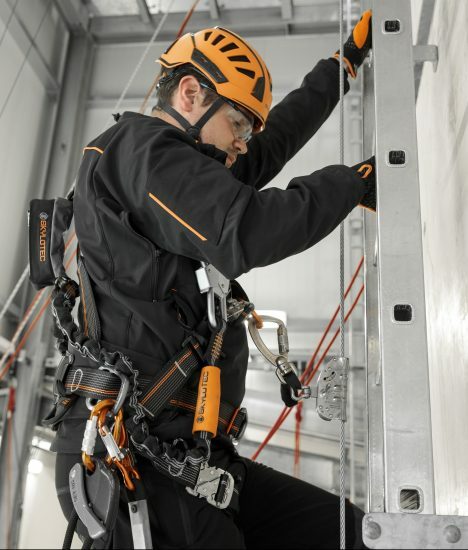 Independently tested on the DBI Lad-Saf vertical climbing system to the above standards. 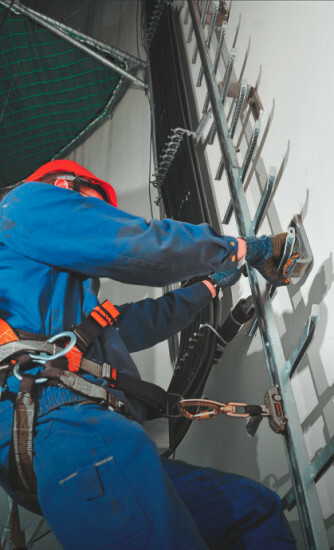 The SKYTAC climbing protection system allows you to climb safely up or down to any height or depth on installed vertical ladders. The guide rail with a C profile is made from 3mm wide galvanized steel and the rungs have an extra zinc layer for better protection against corrosion. 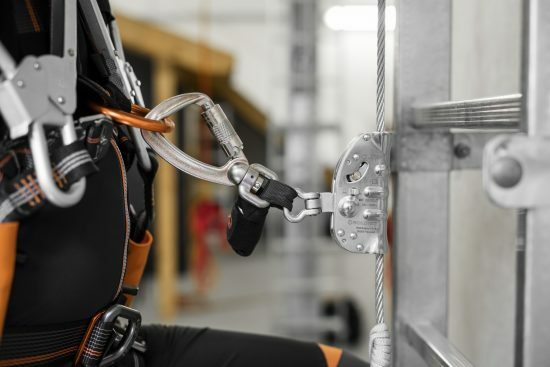 To enhance the safety of users of the climbing protection system, SKYLOTEC has developed the SPEED, the only runner in the world with two redundant brake systems and a catch function that works according to speed. The principle behind SPEED is simple: the lock system is hidden in the housing and is therefore protected against unwanted access. An additional lever means that SPEED works like a pull-back runner. The runner is short and so, therefore, is the fall distance. This makes it easier to climb and also reduces injuries caused during falls. In the event of a failure of the pull-back system, whether through misuse or unfortunate circumstances, the runner can only reach a maximum pre-set speed. If this speed is exceeded, the second safety catch independently kicks in: a centrifugal brake swings the lock system out and the runner is blocked. A high number of catch in the TAC rail allow a very short fall distance. This significantly reduces the risk of injury in the event of a possible fall. Designed to be attached and removed from any point on a C profile rail system, the new SPEED ATTACH surpasses all previous models and still features the usual safety measure of two redundant retention systems. This prevents the occurrence of operating errors or accidental opening of the runner when in use. Certified for both chest and climbing protection eyelet use: No danger of misuse due to incorrect anchoring. A fall indicator on the energy absorber indicates to the user when the runner needs to be taken out of service. Thanks to the modular design of the unit, it is easy to recondition after the energy absorber has been triggered and to replace rollers in the event of wear. 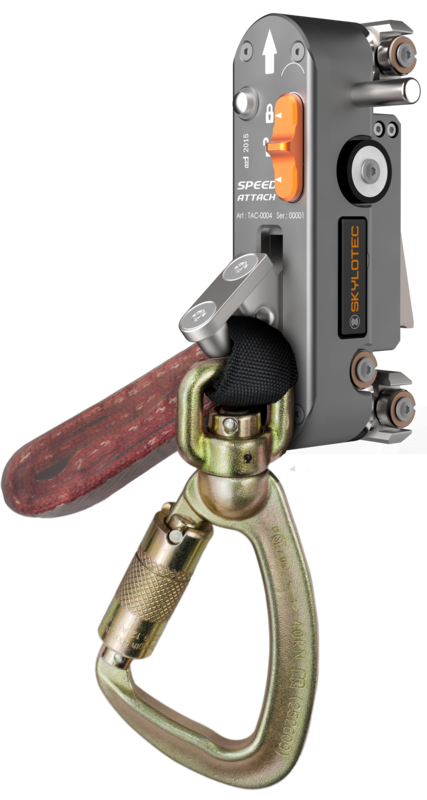 Many safety-relevant features, such as simultaneously operated elements for opening the SPEED ATTACH to reduce accidental misuse to a minimum.